Using a food processor, pulse garlic until minced. Add in chickpeas, tahini, tamari, and parmesan: continuing to pulse until mixture begins to crumble a bit. Finally, add in egg, flour, salt and pepper. Pulse until mixture comes together- it will be sticky. If mixture seems more like hummus, add in 1 more tablespoon of flour. Heat olive oil over medium heat. Wet hands and form four rough looking patties with chickpea mixture. Place patties in skillet and cook on each side until brown, 5 to 6 minutes. Remove and place on a paper towel if patties seem a bit greasy. While cakes are cooking, thinly slice or shave asparagus. Toss with olive oil, salt, and pepper. Once cakes are done, place asparagus in same pan and let cook until begin to soften, 2 to 3 minutes. To make yogurt topping, whisk together yogurt, olive oil, salt, and pepper-taste to make desired flavor. 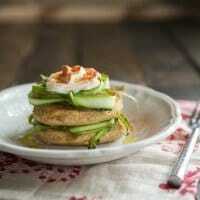 Place cakes on a plate and top with asparagus, yogurt, sprinkle of paprika, and a light drizzle of olive oil. + If you are unable to find vegetarian parmesan, leave it out.